Home » Green & Natural » Jewelweed for Poison Ivy — Does It Work? I just read an article that ridicules the claim that jewelweed is effective against the intense itching of poison ivy. Supposedly research has proven that jewelweed has no anti-itch properties at all. Maybe so… but the stuff really works! I remember one time in particular when my oldest son had somehow gotten himself plastered with poison ivy. He was in absolute agony from the itching and burning, and none of the commercial remedies we tried helped for more than just a few minutes. 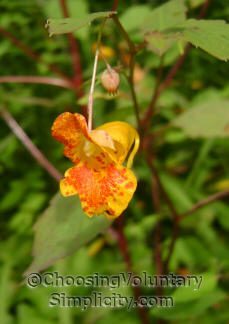 Eventually I remembered reading about jewelweed being used for just this purpose, and since we still had quantities of jewelweed growing around the property… despite years of pulling it out of the gardens and paths… the jewelweed idea seemed worth a try. That first time I just squeezed some of the juice out of the stem onto the blistery areas. The relief from the itching was immediate. Later I tried another method I had read about. I cut up some of the stems, boiled them in water until the water was a reddish-orange color, and then froze the liquid in an ice cube tray. Whenever the itching got bad again, my son would just take a jewelweed ice cube and rub it over the itchy area. Relief was immediate with the ice cubes, too… although it seemed to last longer with the juice straight from the plant. I think the jewelweed might have even helped with healing the blisters too, because I have never seen poison ivy dry up so fast. I guess it’s a good thing we hadn’t seen the research conclusions that jewelweed has no anti-itch properties! P.S. : For my family at least, this ineffective anti-itch reliever works for insect bites too! This is good to know. My sister gets absolutely awful poison ivy that nothing seems to cure. I will certainly remember this. Thanks for this info, Shirley. I have a horror of poison ivy. Now I just have to find some jewelweed somewhere. Here is some info for you, although you probably know this already. That common broad-leaf weed that grows on most lawns, plantain, is an instant itch relief for mosquito bites. I pick a leaf, crush it up, and just rub it on to the bite. Works better for me than any over-the-counter remedy. And it is free! Excellent information. My son is highly sensitive to poison ivy. In fact this year he had to be put on an oral steroid to clear it up. 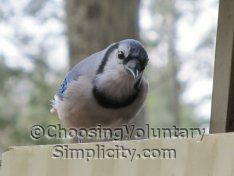 I’m off to check my property for jewelweed! My “housemate” is terribly allergic to poison ivy. I have lots of jewelweed (aka Touch-Me-Not) out back and he’s tried using just the juice before. It helped somewhat, but what he did this year was put pieces of the whole plant (stems and leaves) in the food processor. It worked like magic. The ugly, itchy, weeping rash stopped spreading almost immediately and by the next day healing had begun. In a few days it was totally gone! Jewelweed is age old remedy. It is also referred to as pop weed because the seeds pop when the plant is mature. I have seen it growing alongside Poison Ivy. I have used it too and it works to relieve itch. I have also used mud by our pond which has a drying effect . I always try to use jewelweed within an hour of exposure. For example, today after I pulled a “weed” in my yard, I found myself holding poison ivy in my hands! I immediately took a bus to a nearby park, broke off a jewelweed plant sliced open the stem, and rubbed it on my hands right there in the park. Eight hours later, I have no itch and no rash!